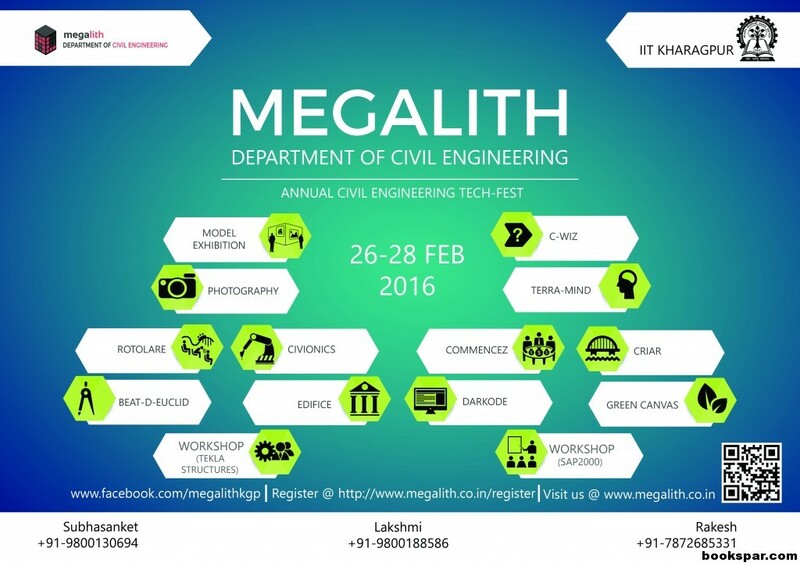 Megalith is the annual festival of the Department of Civil Engineering, Indian Institute Of Technology, Kharagpur to be held from 26th February to 28th February 2016 under the patronage of the Institution of Civil Engineers,U.K. 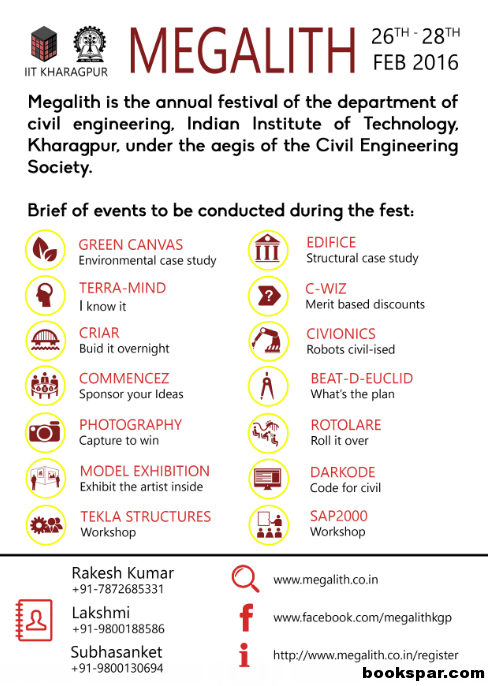 Since its initiation in 2009, Megalith has conquered a huge success in the field of engineering and corporate sector and has grown as largest civil engineering Technical Fest of India. Megalith offers a diverse range of competitions, workshops and guest lectures. The sole objective of Megalith is to promote and encourage ideas and innovation in the field of civil engineering and it strives to present a platform to the civil engineering students to work and interact with several civil engineering aspects. Department of Civil engineering introduced Megalith at national level as a dais where eminent personalities from the industry and academia can muster and share their knowledge which they have gathered from their experience over the years. Megalith events aim at challenging all budding civil engineering students to the skills required for the trade, from a computer drawing to design, coding to actual construction,join us in aur celebration of feats of Civil Engineering. Construction – An art for a few, but a talent for many. Trusses, beams, columns and many other theories. If you have an unexplainable passion for structural engineering, then this one is definitely for you. It is an overnight on-the-spot event for designing and building a structure by providing on-site raw materials. The event basically calls for teamwork, spontaneity and judicial use of raw materials provided. But the growing greed of us is making the greenery from this beautiful planet disappearing. Environmental issues are of major concern in today’s avaricious world. As the pollution is increasing rapidly day by day, there are serious environmental hazards and issues. Here is an environmental case study in which the problems concerning the environment and its protection are discussed. Are you a coding aficionado and a Civil Engineering geek? Megalith presents Darkode, a unique opportunity to showcase your coding skills while solving arduous problems of Civil Engineering. Reflect on a problem statement in light of civil engineering and formulate an efficient algorithm to solve it. Civionics comprises of the combination of civil engineering and electronics. Megalith, with an aim to encourage innovation in engineering among the students presents Civionics, a mechanical robot modelling contest. The primary technical goal of participating teams would be to develop effectual ground robots capable of executing tasks given in the problem statement. The most incredible structures that you notice around the world are contrived by structural engineers. Structural Engineering is an integral part of Civil Engineering. To make a structure that can amaze the minds of people, not only requires greater knowledge about mechanics of materials, but also it needs your greatest imaginations and immense hard work. EDIFICE is a structural case study event that will give you an opportunity to explore and test your abilities as a structural designer. The highest exercise of imagination is not to devise what has no existence, but rather to perceive what really exists. Imagination is not an art, but the method of learning. So, here is the event Beat-D-Euclid, which is an on-the-spot event which tests the perception and modelling abilities of the participants. It is the 2D visualization of a given 3D structure in a given time span using AutoCAD software. So Megalith through its mind-boggling event presents you a platform to challenge and compete with the fighter within you. This is a revolutionized style of conducting a civil engineering quizzing event testing the knowledge of the participants in a wide range of the fields of Civil Engineering, namely Environmental Engineering, Geotechnical Engineering, Structural Engineering, Transportation Engineering and Water Resources Engineering. It is one of the best opportunities for the intellect minds to showcase their knowledge and skills. A golden oppurtunity to pitch forward your ideas in front of various company representatives present there.If convinved by your idea,they may approach and contact you and you may get funding for your start-up,which is the major problem faced by ones with the bright and different ideas. Megalith presents to you an easy and interesting way to win exciting prizes on just a click. All you have to do is answer some simple questions put up in website every day. You can be among the lucky 100 winners who will win coupons worth Rs 10,000 everyday. Roller Coaster is an astonishing structure which provides us exciting rides without using any external power. Megalith, with an aim to unveil the hidden talent and encourage innovation places a unique opportunity before the participants to acquire such ecstatic feeling through this event which analyses the creativity of building amazing roller coaster within provided specifications. It is an on the spot event to be conducted for the first time in Megalith. The competition encourages entries showing striking Civil Engineering moments, structures, people etc. entirely up to the imagination and creativity of the contestants and their interpretation of the theme. Megalith here gives you an opportunity to exhibit your creativity and prepare a model static or dynamic of civil engineering structures and bring it for exhibition at the time of the fest. Note: Students from far away colleges will be provided with accommodation.